I’m so excited to share my new Five-Strand Braid How-To Video class on Creativebug. You’ll learn this versatile braiding technique in no time. Then, there are so many fabulous things you can make. Braiding is simply weaving at its most basic level and follows a pattern. Once you learn it, you can take off from there. Make headbands, belts, bracelets, key fobs, straps for bags, and more! Even better, Creativebug is offering new members a 1 month free trial + 1 free class to keep forever here! 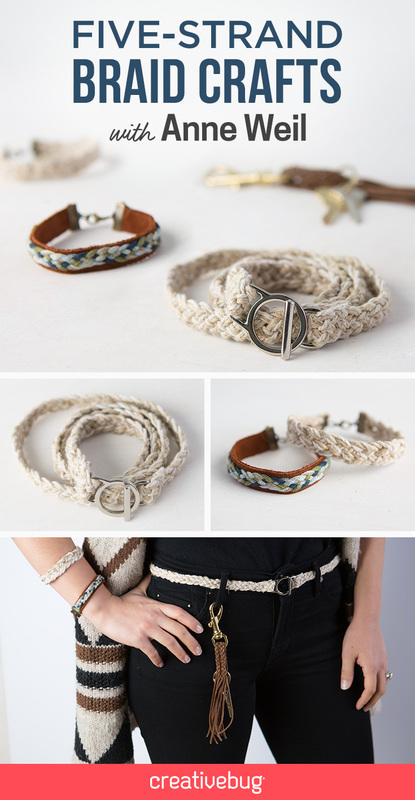 In the class, I use a combination of leather, embroidery thread and twine to make these fun bracelets. Adding the embroidery thread braid to leather, and finishing with jewelry hardware elevates the simple braid to something more substantial. The Valdani embroidery thread is hand-dyed, and can be found in all sorts of gorgeous colors. The leather tasseled key fob is a seven-stranded braid. You can increase the number of strands from there. In the video class, I walk you through the technique in detail and then show you how to make each one of these projects. I love to imagine the twine, braided belt gathering a pretty white shirt dress. You could make it long enough to wrap twice, too. What a beautiful gift to make for someone! Harken back to your summer camp days and learn how to master the five-stranded braid. Anne Weil shares the standard technique for working this fancy braid and then shows how to apply it to bracelets, belts, and straps. 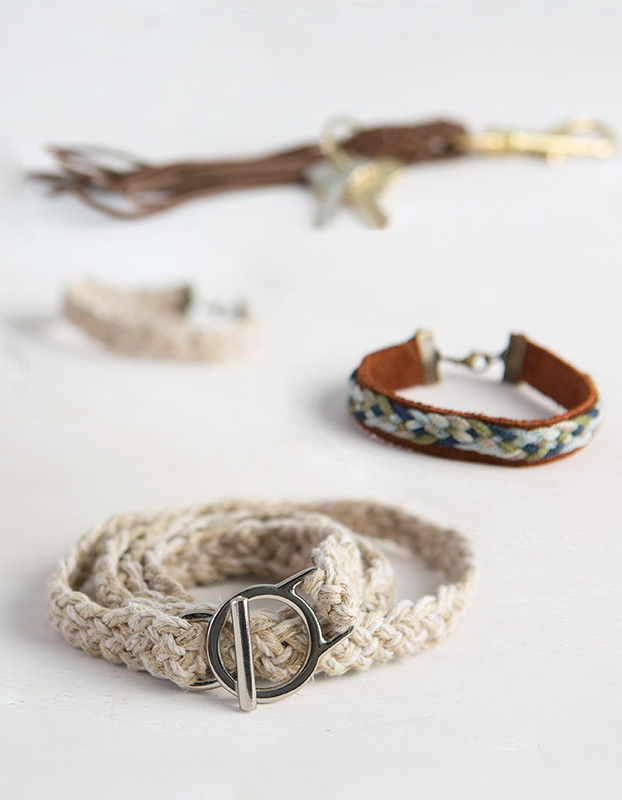 Create the grownup version of a friendship bracelet by attaching your braid to a leather band. Finish it off with jewelry hardware. You’ll also learn how to use twine to create a belt. 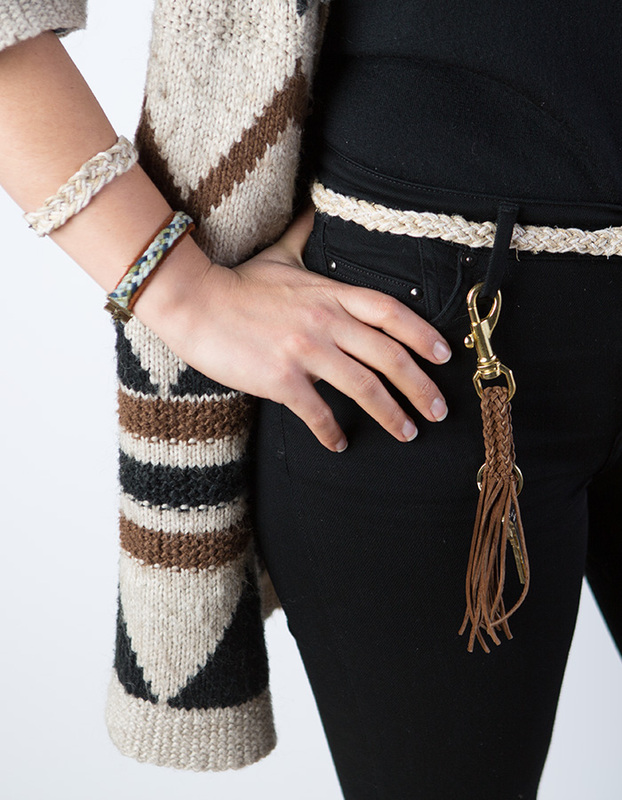 Plus, use leather cording to create a seven-strand wristlet key fob. Once you get the hang of this simple braiding technique, you will be able to braid just about any type of fiber, be it yarn, rope or floss. Once you join Creativebug, you won’t go back to regular old YouTube tutorials! These videos are top notch professional quality with beautiful imagery. You’ll find the videos shot in long form so you can follow along and make the projects with ease. So go take the Five-Strand Braid How-To Video class and get cracking making all sorts of fun things this summer! Other video classes I have include: Arm Knit Cowl, Arm Knit Pillow, Arm Knit Garter Stitch Throw Blanket, and Crochet Stones. Come join me there! It’s super fun. Goodmorning. I realy would like to know where i can buy the things you used as endings (the circle and the I). Hope you understand what i mean. You can buy those endings at a local craft store like Michaels or Joann’s/. do you have those stores in your area?